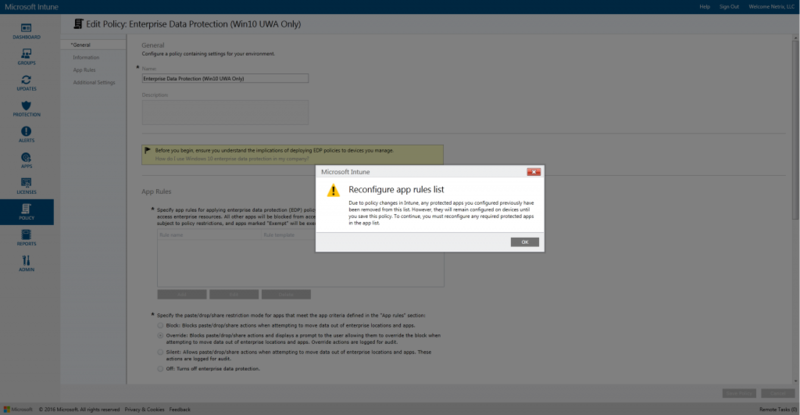 Last week, I published a blog article walking through some of my favorite updates from the Intune Updates page. Turns out many of those functions (except for ISE integration) rolled last night! 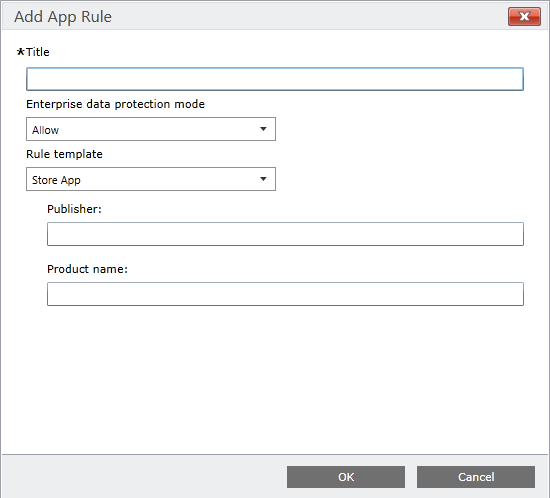 As the release of Windows 10 Redstone nears and Enterprise Data Protection (EDP) goes live, Microsoft is making changes to its EDP policies in Intune. 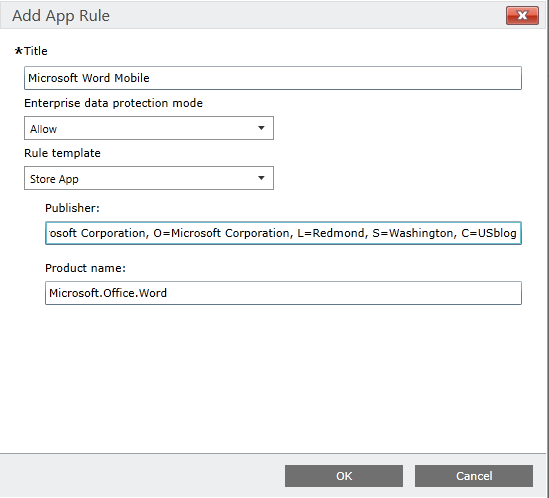 It now looks like there are now methods to add apps via File Hash or Path, instead of just Publisher rules amongst some other minor changes as well. We can see that the overall experience has changed slightly for configuring EDP in the portal. 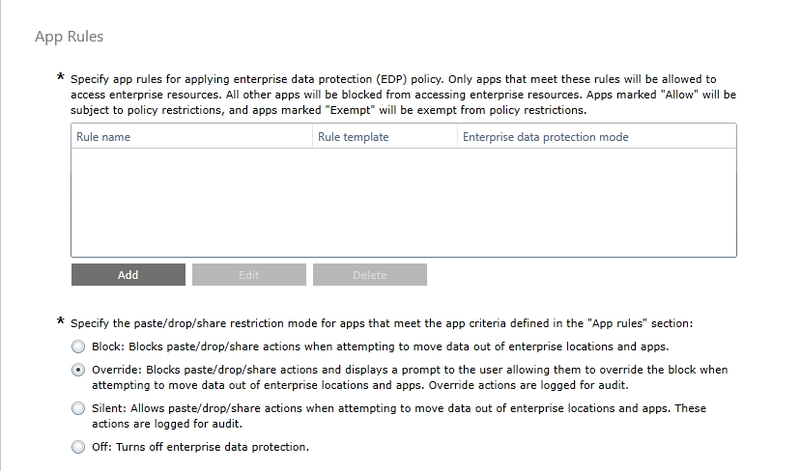 Most noticeably, we see that Microsoft warns us when I open a pre-existing EDP policy that it will wipe the existing app rules. In this case I have a policy dedicated for UWA apps and only had Excel, OneNote, PowerPoint & Word, so not a big deal. We can see that there’s a slight change to the layout from before (used to just have Publisher and Product Name), now we’re creating rules to align here. 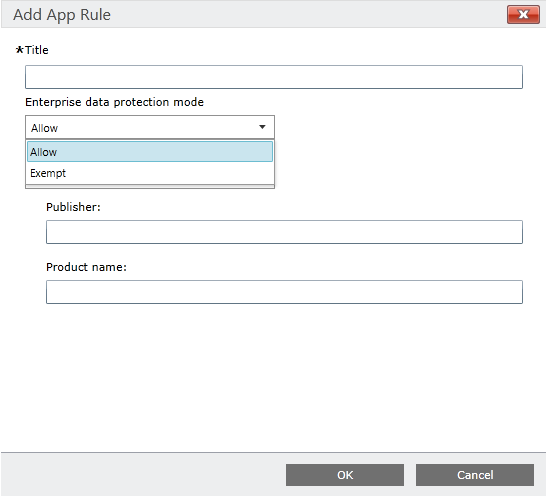 EDP-aware apps are expected to prevent enterprise data from going to unprotected network locations and to avoid encrypting personal data. On the other hand, EDP-unaware apps might not respect the corporate network boundary and will encrypt all files they create or modify, meaning that they could encrypt personal data and cause data loss during the revocation process. 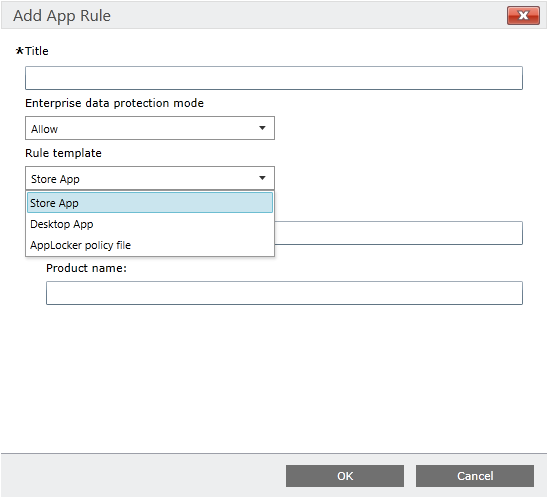 Care must be taken to get a support statement from the software provider that their app is safe with EDP before adding it to your Protected App list. I also published a list from my machine in my last blog! Now we have our apps loaded! 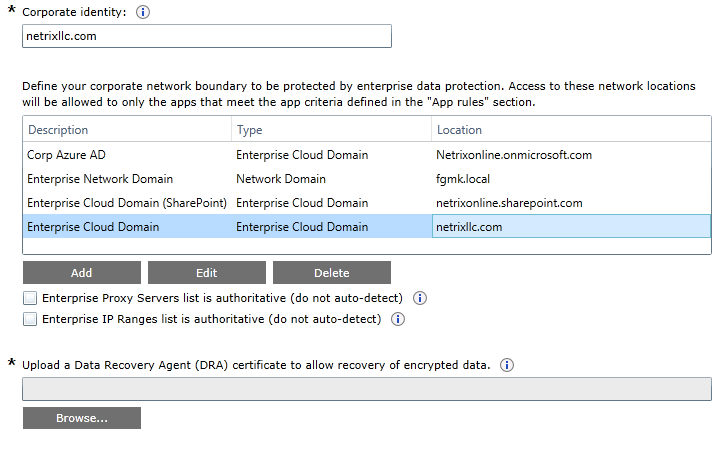 Now check your configuration for identity and locations. You can see some new Additional Settings here as well, note that some of the RMS integration that was here prior is now gone. Specifically we see some UI options to configure for displaying the EDP overlay and Personal/Work ownership settings (which didn’t exist before.